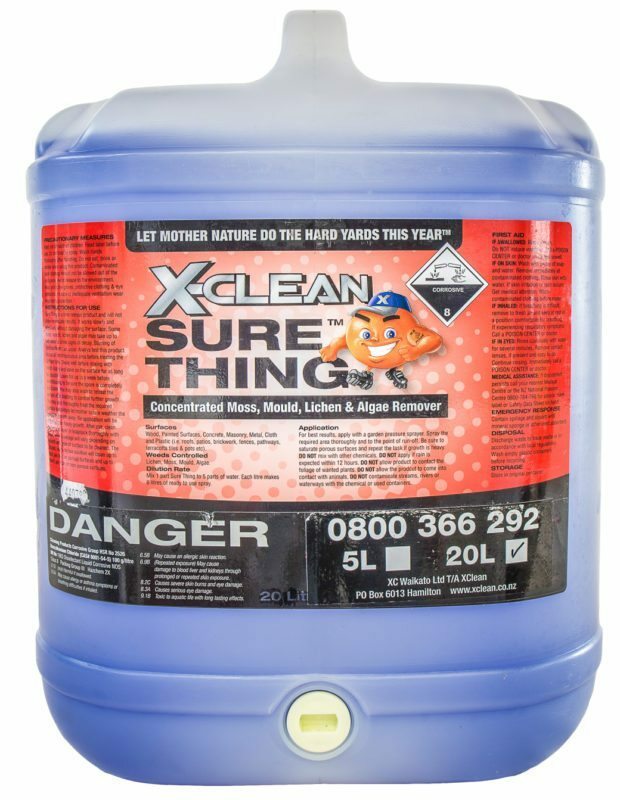 One thing Sure Thing will do is clear moss off a lawn. This use of Sure Thing is slightly different than any other use. The reason you have to be careful when doing this is that Sure Thing can easily damage plants, particularly when it is applied at too strong a dilution rate. However with careful use you can easily remove all of the moss from your lawn. The first thing to do is to dilute your Sure Thing to a 1:10 dilution (one part Sure Thing to ten parts water). This is probably the only time you will use Sure Thing at a different rate to usual, and it is important to get this step correct. Next spray the entire lawn. Give the lawn a good spray. Don’t spray hard enough to saturate the lawn, but enough that you want to make all of the grass damp. Ensure you do this on a fine day. Watch the lawn, if your growth of moss is only light almost all of the moss should turn brown within 48 hours. If you have a heavy growth of moss you will need to do a repeat application. It is recommended that this repeat application be done 5-8 days after the first application. For the second application follow the same steps as the first application. Dilute your Sure Thing to a ratio of 1:10, and give the lawn a good spray on a fine day. 24-48 hours after this second application all of the moss should be brown. The two weaker doses ensure that the Sure Thing cannot overload the root system of your grass causing it to die. Whilst Sure Thing will not usually damage grass there are extreme cases where it can. Doing two light coats of Sure Thing ensure your grass remains fine will killing the moss. This entry was posted in Sure Thing, Tips and tagged Grass, Moss & Mold, Sure Thing.